‘In the New Covenant, prayer is the living relationship of the children of God with their Father who is good beyond measure, with his Son Jesus Christ and with the Holy Spirit.’ With these words, from the introduction to the fourth section of the Catechism of the Catholic Church, we are reminded that the life of the Catholic Christian is not simply about blindly following a set of rules, but is ultimately about being drawn deeper into unity with our Triune God. For those who have read it, this last section of the Catechism is amazingly beautiful, as it is profound. Describing the joys and struggles of personal prayer, as well as the history and development of prayer in the Scriptures and life of the Church, it provides a wonderful basis for all of us wishing to grow in prayer; for left alone, we do not know how to pray as we ought. While there is much to recommend, I want to focus on one section: paragraphs 2725-2745, entitled ‘The Battle of Prayer.’ Acknowledging that ‘prayer is both a gift of grace and a determined response on our part,’ these paragraphs affirm that prayer is not always easy, sometimes there is dryness in prayer and the heart aches for a response from God, yet only silence is heard. When one experiences such things, it is tempting to think that the method one is using for prayer is wrong or that God has somehow left you alone in the desert to wander on your own. Rather, it is often the case that God might be asking for strength and discipline in prayer, refining the impure motivations and helping to dispose the heart to be set only on Him. Many of the spiritual masters in our tradition talk of prayer like a muscle, that unless it is exercised, it will atrophy and disintegrate. Then when need arises and one turns to prayer, nothing happens. The will has been so weakened, it is unable to respond, truly a frightening proposition! But the Catechism gives some helpful guidance in this regard. In the face of difficulty in prayer, the Church calls for vigilance. The bridegroom comes in the middle of the night, and blessed are those who are prepared for his return. This vigilance calls for an attentiveness of heart to the promptings of the Spirit, but the heart will only hear those promptings if it has been conditioned to do so. The Catechism also highlights temptations found in a lack of faith and acedia. The prior is getting caught up in the cares and concerns of this world, only turning to the Lord as a last resort, highlighted by the phrase: ‘I have tried everything else, I might as well pray.’ Perhaps if we had the habit of praying first, God would help us find the pathway out of this particular mess quicker! Acedia, on the other hand, is becoming too comfortable, a ‘lax ascetical practice.’ In this, the will is not conditioned to deny itself, untrained by fasting and almsgiving; even the smallest temptations are unable to be resisted. As we grow in prayer, three fruits begin to manifest: trust, hope and charity. The heart that prays trusts in God’s providential care that no matter the storm, the Loving Father will help you to see it through to the end. In essence, ‘Do not tell God how big the storm is, but rather tell the storm how big God is!’ The heart that prays is formed to hope that that there is more here than meets the eye. It recognizes that this world is not all there is, but that there is a paradise awaiting on the other side. Finally, the heart that prays is the heart that loves. 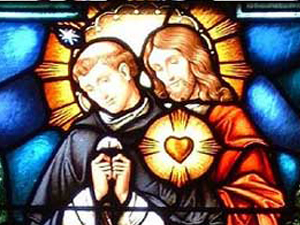 It is the power of love for both God and our fellow men that enables the heart conditioned by prayer to persevere over difficulty for the sake of the other, that they too might dwell in God’s Eternal Home in the life to come.